As the Spanish summer ramps down into autumn its time to ramp up the researching and writing. The outline plan [for next few weeks, or so] is to perform a basic reality check on some of the major historical narratives from the 1st millennium. Once again my yardstick for evaluating these historical narratives from the 1st millennium is the Old Japanese Cedar Tree analysis performed by Leona Libby in 1976. The downside to researching the mainstream historical narratives [from the 1st millennium] is that Western Historians have predominantly Gone West and transformed 1st millennium history into a deceptive and depressing Dismal Art. Therefore, as an antidote and aperitif, let me introduce Lawrence. 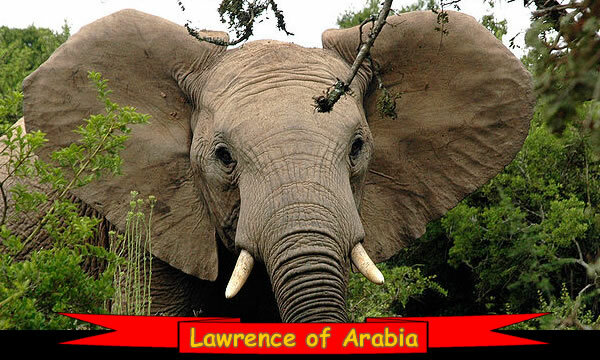 Lawrence is an young African elephant who is particularly puzzled by the history of the Arabian Peninsula in the 1st millennium. That’s why I call him Lawrence of Arabia. Some of Lawrence’s ancestors were War Elephants. A war elephant is an elephant that is trained and guided by humans for combat. The war elephant’s main use was to charge the enemy, breaking their ranks and instilling terror. Elephantry are military units with elephant-mounted troops. They were first employed in India, the practice spreading out across south-east Asia and westwards into the Mediterranean. Their most famous use in the West was by the Greek King Pyrrhus of Epirus and in significant numbers by the armies of Carthage, including briefly by Hannibal. In the Mediterranean, improved tactics reduced the value of the elephant in battle, while their availability in the wild also decreased. In the east, where supplies of animals were greater and the terrain ideal, it was the advent of the cannon that finally concluded the use of the combat elephant at the end of the 19th century, thereafter restricting their use to engineering and labour roles. One of the earliest references to war elephants is in the Indian epic Mahabharata (written in the 4th century BCE, but said to describe events between the 11th and 8th centuries BCE). Elephant cavalry first appeared three thousand years ago, simultaneously in India’s Vedic Civilization and in China. Female Asian elephants were used, sometimes in small groups, sometimes in vast regiments of thousands of animals in the 13th century, primarily to produce a tactical “shock and awe” effect in the field. In addition, the large animals provided elevated platforms from which archers could rain down arrows on the enemy, and from which generals could survey the battle. More specifically, Lawrence’s ancestors were involved in the Year of the Elephant when an army of “forty thousand men” and [up to] eight War Elephants were totally destroyed by “tiny stones” [that “turned them to ashes”] as they marched from Sana’a to Mecca. The Year of the Elephant is the name in Islamic history for the year approximately equating to 570 CE. The name is derived from an event said to have occurred at Mecca: Abraha, the Christian ruler of Yemen, which was subject to the Kingdom of Aksum of Ethiopia, marched upon the Kaaba with a large army, which included one or more war elephants, intending to demolish it. However, the lead elephant, known as Mahmud, is said to have stopped at the boundary around Mecca, and refused to enter. It has been theorized that an epidemic such as by smallpox could have caused such a failed invasion of Mecca. The year came to be known as the Year of the Elephant, beginning a trend for reckoning the years in the Arabian Peninsula used until it was replaced with the Islamic calendar [in 638] during the rule of Umar [634 – 644]. In Islamic history there is a significant event known as The Year of the Elephant, approximately equating to 570 AD. At that time Abraha, the Christian ruler of Yemen marched upon the Kaaba, intending to demolish it. He had a large army, which included one or more elephants, (as many as eight, in some accounts). However, the (single or lead) elephant, whose name was Mahmud, is said to have stopped at the boundary around Mecca, and refused to enter – which was taken by both the Meccans and their Yemenite foes as a serious omen. Abraha, incensed, launched an expedition of forty thousand men against the Kaaba at Mecca, led by a white elephant named Mahmud (and possibly with other elephants – some accounts state there were several elephants, or even as many as eight) in order to destroy the Kaaba. 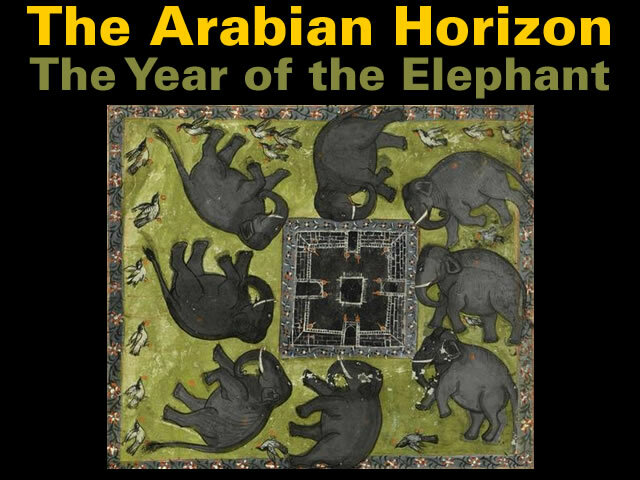 The “Year of the Elephant”, famous in Moslem history, was an incident of the Abyssinian war in Arabia. The year of the Elephant is 570 or 571 – the year of Mohammed’s birth. In that year an Abyssinian Christian general, whom the Arabs call Abraha al Ashram, marched on Mecca with an army and elephants, threatening to destroy the Ka’ba. But he was defeated and his army was destroyed in some unknown manner, concerning which the Koran has a story of signs and wonders. Sūrat al-Fīl (“The Elephant”) is the 105th chapter (sura) of the Quran. Taking its name from the mention of the “Army of the Elephant” in the first verse, this surah alludes to the Abyssinian campaign against Mecca in the year 570 of the Christian era. Abrahah, the Christian viceroy of the Yemen (which at that time was ruled by the Abyssinians), erected a great cathedral at Sana’a, hoping thus to divert the annual Arabian pilgrimage from the Meccan sanctuary, the Kabah, to the new church. When this hope remained unfulfilled, he determined to destroy the Kabah; and so he set out against Mecca at the head of a large army, which included a number of war elephants as well, and thus represented something hitherto unknown and utterly astounding to the Arabs: hence the designation of that year, by contemporaries as well as historians of later generations, as “the Year of the Elephant“. Abrahah’s army was totally destroyed on its march – by an extremely huge flock of martin swallow birds that dropped tiny stones onto them and turned them to ashes – and Abrahah himself died on his return to Sana. Wikipedia notes this [roughly] 1,000 kilometre march was “difficult” and “far from the appropriate place for African Elephants” because of the “mountainous terrain” and “desert road”. 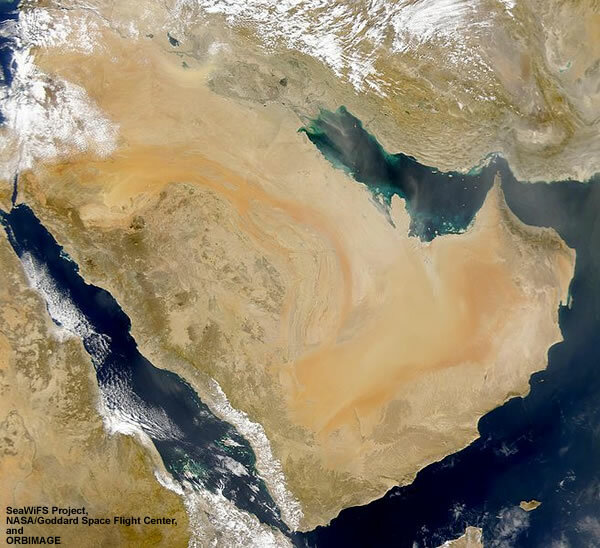 Furthermore, the Arabian Peninsula is far from the appropriate place for African Elephants, while the mountainous terrain of Northern Yemen and the desert road between Yemen and Mecca would make campaigning with them difficult. In general, the climate is extremely hot and arid, although there are exceptions. Higher elevations are made temperate by their altitude, and the Arabian Sea coastline can receive surprisingly cool, humid breezes in summer due to cold upwelling offshore. However, “difficult” is a significant understatement because the “mountainous terrain” and “desert road” suggests it would have been virtually impossible for “forty thousand men” [and up to eight elephants] to be self-sufficient [in terms of food and water] during their long march. Male African elephants are the largest extant terrestrial animals and can reach a height of 4 m (13 ft) and weigh 7,000 kg (15,000 lb). Estimates of daily dry matter intake by adults of about 1.0-1.5% of body weight. Adult elephants consume an average of 140 to 200 L of water per day. The Persians also had to overcome this very basic logistical challenge [of food and water] when marshalling, for example, “300,000 men and war elephants” in their arid and mountainous land. Persians used war elephants at the Battle of Gaugamela in 331 BC. The Persians had 15 Indian-trained war elephants, which were placed at the centre of the Persian line, and they made such an impression on the Macedonian troops that Alexander felt the need to sacrifice to the God of Fear the night before the battle. The most famous was the Battle of Avarayr in 451 AD, where Armenian rebels led by Vartan Mamikonian led an army of 66,000 men to gain independence from the Sassanids under Yazdegerd II, who opposed them with 300,000 men and war elephants. Iran consists of the Iranian Plateau with the exception of the coasts of the Caspian Sea and Khuzestan Province. It is one of the world’s most mountainous countries, its landscape dominated by rugged mountain ranges that separate various basins or plateaux from one another. 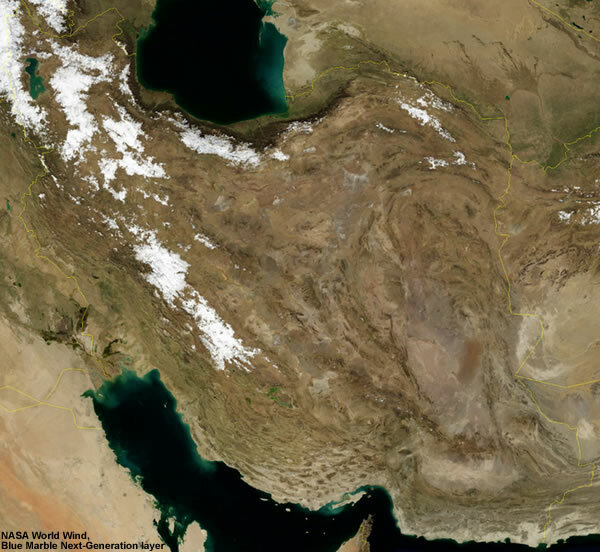 Iran’s climate ranges from arid or semiarid, to subtropical along the Caspian coast and the northern forests. Similarly, the Carthaginians had to overcome this very basic logistical challenge [of food and water] when marshalling men and war elephants. The Ptolemies and the Carthaginians began acquiring African elephants for the same purpose, as did the Numidians and the Kushites. Perhaps inspired by these victories, Carthage developed its own use of war elephants and deployed them extensively during the First and Second Punic Wars. The usual Carthaginian war elephants, despite popular depictions, were the smaller North African elephants [Loxodonta africana pharaoensis], an African bush elephant population or subspecies also now extinct. Carthage was the Phoenician city-state of Carthage and during the 7th to 3rd centuries BC, included its sphere of influence, the Carthaginian Empire. The Punics, also known as Carthaginians, were a people from Ancient Carthage in modern-day Tunisia, North Africa, who traced their origins to the Phoenicians and Berbers. However, it appears that many Middle Eastern empires successfully imported elephants from Sub-Saharan Africa [or India] and overcame the associated logistical challenges because execution by elephant was “commonly employed” to demonstrate “absolute power” in the Middle East. The animals were trained and versatile, able to kill victims immediately or to torture them slowly over a prolonged period. Most commonly employed by royalty, the elephants were used to signify both the ruler’s absolute power and his ability to control wild animals. 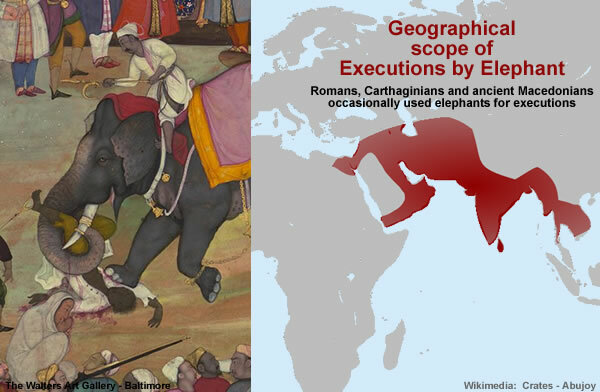 During the medieval period, executions by elephants were used by several West Asian imperial powers, including the Byzantine, Sassanid, Seljuq and Timurid empires. The Romans, Carthaginians and ancient Macedonians occasionally used elephants for executions while also making use of war elephants for military purposes, most famously in the case of Hannibal. 1) The ancients had miraculous logistical skills. 2) The stories of War Elephants are vague exaggerations and myths. 3) The Middle East was less mountainous in ancient times. 4) The Middle East was less desiccated in ancient times. The Western mainstream [unsurprisingly] emphasises vague exaggerations and myths. For example, the Western mainstream notes “neither Xenophon nor Herodotus mention war elephants” in their accounts of the “earlier” Persian campaigns. The Persians are known to have used fifteen war elephants at Gaugamela, but some people claim that they had been used previously in the Greek campaign of King Xerxes I of Persia, and even further back at the time of Darius the Great at the Indus, the Danube and against the Scythians in 512 BC. Neither Xenophon nor Herodotus mention war elephants in their accounts of these earlier campaigns. Xenophon of Athens (c. 430–354 BC) was an ancient Greek historian, soldier and mercenary, and a student of Socrates. Herodotus was a Greek historian who was born in Halicarnassus in the Persian Empire (modern-day Bodrum, Turkey) and lived in the fifth century BC (c. 484–c. 425 BC), a contemporary of Socrates. Whilst, regarding Arabia, the Western mainstream notes Procopius of Caesarea “made no mention” of the Year of the Elephant. Recent discoveries in southern Arabia suggest that Year of the Elephant may have been 569 or 568, as the Sasanian Empire overthrew the Axumite-affiliated regimes in Yemen around 570. However, the Islamic narrative of this event is disputed by authorities including the historian Procopius of Caesarea, who documented Abara’s life but made no mention of these events. Interestingly, a very similar narrative in Armenia that took place in the 6th century can be found. This story was recorded by the Armenian bishop Sebeos. This omission by Procopius of Caesarea is hardly a surprise because [according to the mainstream] he died [“c. 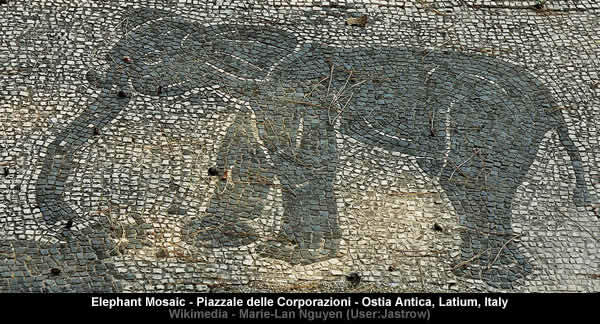 554 AD”] about 15 years before the Year of the Elephant [circa 570 AD]. Procopius of Caesarea (c. 500 – c. 554 AD) was a prominent late antique scholar from Palaestina Prima. Accompanying the Roman general Belisarius in the wars of the Emperor Justinian, he became the principal historian of the 6th century, writing the Wars (or Histories), the Buildings of Justinian and the celebrated (and infamous) Secret History. He is commonly held to be the last major historian of the ancient Western world. Provenance (from the French provenir, “to come from”), is the chronology of the ownership, custody or location of a historical object. It was this same Reverend Milman, incidentally, who declared Procopius’s ‘Secret History’ the worst book in all literature: a summary which may quietly be disregarded, since the certainly orthodox authorities at Rome thought the manuscript worth preserving all these centuries in the Vatican Library as part of the great human record. Here, then, is an important document covering the greater part of the sixth century of Our Lord and the pious reign of their Imperial Majesties Justinian and Theodora, by the grace of God Rulers of the Holy Roman Empire of the East and of the West, and Defenders of the True Faith . . . Mentioned by the lexicographer Suidas circa 1100, the loss of this valuable work to modern readers was lamented by Baronius in 1548, though the manuscript was then in his custody in the Vatican. A later and more diligent librarian one day discovered the ‘Secret History,’ and it was published for the first time in print in 1623, the first English translation appearing in 1674. The Very Reverend Henry Hart Milman (10 February 1791 – 24 September 1868) was an English historian and ecclesiastic. Suidas was a Greek lexicographer of the tenth century bequeathed a glossary, a loose collection but covers many fragments of interest on literary history, among other segments of works by contemporary authors who have not survived today. The glossary of Suidas was a hybrid between a dictionary and a full-blown encyclopaedia. The Western mainstream clearly has some problems reconciling dates in their narratives. Firstly: Procopius died about 15 years before the Year of the Elephant [570 AD]. Secondly: Abraha al Ashram [who marched on Mecca with his army and elephants in 570] may have died about 15 years before [or ceased being the ruler of Yemen 5 years before] the Year of the Elephant. Abraha (also spelled Abreha) (died after AD 553; r. 525 – at least 553), also known as ‘Abraha al-Ashram, was an Ethiopian general then the viceroy of southern Arabia for the Kingdom of Aksum, and later declared himself an independent King of Himyar. Abraha ruled much of present-day Yemen and Hijaz from at least 531 -547 AD to 555 – 565 AD. Thirdly: Although “recent discoveries” suggest the Year of the Elephant occurred in “569 or 568” it appears mainstream “historians” believe it “occurred at least a decade” earlier. However, historians today believe that this event occurred at least a decade prior to the birth of Muhammad. Muḥammad (570 CE – 8 June 632 CE) is the central figure of Islam and widely regarded as its founder by non-Muslims. Born approximately 570 CE in the Arabian city of Mecca, Muhammad was orphaned at an early age; he was raised under the care of his paternal uncle Abu Talib. Therefore, if the independent observer doesn’t believe in miraculous logistical skills and is unconvinced by Procopius making “no mention” of the Year of the Elephant then there is the possibility that Arabia was less mountainous and/or less desiccated in the first half of the 1st millennium. Intriguingly, initial indications suggest this possibility may have some validity because the North African forest elephant [that ranged across North Africa to the Red Sea] only became extinct [approximately] at the end of the 1st century. The animal used was the North African forest elephant which would become extinct from over-exploitation. The North African elephant (Loxodonta africana pharaoensis) was the subspecies of the African bush elephant (Loxodonta africana), or possibly a separate elephant species, that existed in North Africa north of the Sahara until becoming extinct in Ancient Roman times. Other names for this animal include the North African forest elephant, Carthaginian elephant, and Atlas elephant. 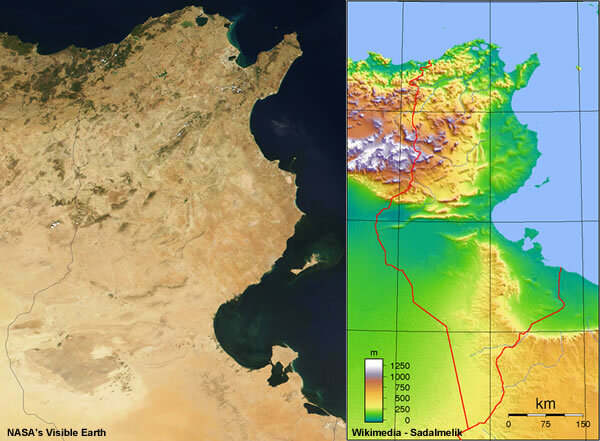 Originally, its natural range probably extended across North Africa and down to the present Sudanese and Eritrean coasts. … the Ptolemies established hunting stations and ports as far south as Port Sudan, from where raiding parties containing hundreds of men searched for war elephants. Additionally, this extinction event makes sense within the context of the Old Japanese Cedar Tree, the Realigned Roman Empire Time Line [in red] and the Islamic calendar. The point from which the pre-Islamic Arabian calendar begins is unclear. Significant events also served as reference points for measuring years. The year of Prophet Muhammad’s birth is identified as ‘the Year of the Elephant’, when Mecca was attacked by invaders accompanied by an elephant. The event was already auspicious; according to the Qur’ an, God saved the Meccans from this overwhelming force by sending a swarm of birds that pelted the invaders with clay stones and drove them away (105.1–6). The fact that it is the year of Prophet Muhammad’s birth made the Year of the Elephant even more important and the early Muslim community appears to have continued using the Year of the Elephant as a calendrical reference point. Caliph ‘Umar (d. 644 CE ) changed that practice, identifying the Prophet’s pilgrimage from Mecca to Medina (622) as the beginning of the Islamic calendar. In 638, his fourth year as caliph and the seventeenth year 17 since the Hijra, he decreed that the Islamic calendar should be counted from the year of the Hijra of Muhammad from Mecca to Medina. i.e. only 200 years before the North African forest elephant became extinct. The Syrian elephant or Western Asiatic elephant (Elephas maximus asurus) is a proposed name for the westernmost population of the Asian elephant (Elephas maximus), which became extinct in ancient times. Skeletal remains of E. m. asurus have been recorded from the Middle East (Turkey, Iraq and Syria) from periods dating between 3 million years BC and 100 years BC. In Western Asia, the elephants ranged from the mangrove forests of southern Iran, to southern Anatolia, the Syrian steppes and even extended to Palestine. “Syrian” elephants are frequently mentioned in Hellenistic history; the Seleucid kings, who maintained numerous war elephants, reigned in Syria during that period. 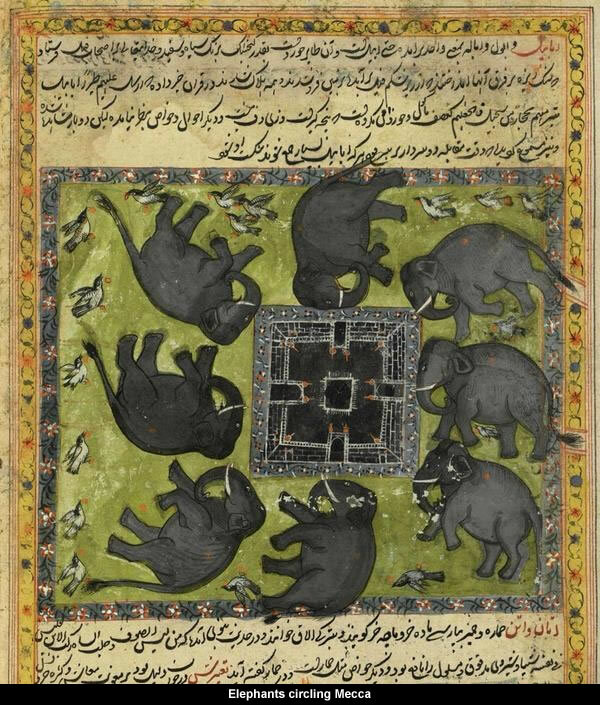 These elephants are believed to be Indian elephants (E. m. indicus), which had been acquired by the Seleucid kings during their eastern expansions. Squealing War Pigs and flaming Incendiary Pigs were used as countermeasures against War Elephants. According to legend recounted in the “Alexander Romance” by Pseudo-Callisthenes, Alexander the Great learned about this “secret weapon” against war elephants from Porus in India. Pliny the Elder reported that “elephants are scared by the smallest squeal of the hog”. Aelian[ confirmed that elephants were frightened by squealing pigs (and rams with horns), and reported that the Romans exploited squealing pigs (and rams) to repel the war elephants of Pyrrhus in 275 BC. Procopius, in History of the Wars, records that the defenders of Edessa suspended a squealing pig from the walls to frighten away Khosrau’s single siege elephant in the sixth century AD. Historical accounts of incendiary pigs or flaming pigs were recorded by the military writer Polyaenus and by Aelian. Both writers reported that Antigonus II Gonatas’ siege of Megara in 266 BC was broken when the Megarians doused some pigs with combustible pitch, crude oil or resin, set them alight, and drove them towards the enemy’s massed war elephants. The elephants bolted in terror from the flaming, squealing pigs, often killing great numbers of their own soldiers by trampling them to death. Gallery | This entry was posted in Arabian Horizon, Catastrophism, Dendrochronology, Heinsohn Horizon, History, Old Japanese Cedar Tree. Bookmark the permalink. One puzzle is GH’s reference to “Allah’s Celestial Elephant Stones”, which I assume mean large meteoric fragments. Except I can’t find a primary reference to the phrase and it’s not in the Quran. I wonder where it was first noted. a) So many references have such interesting provenances. b) So many belief systems have competing historical narratives.